A 3-year-old Bangor boy was returned to Almighty Beginnings Daycare and Preschool Monday after he briefly escaped the center through a fire door. 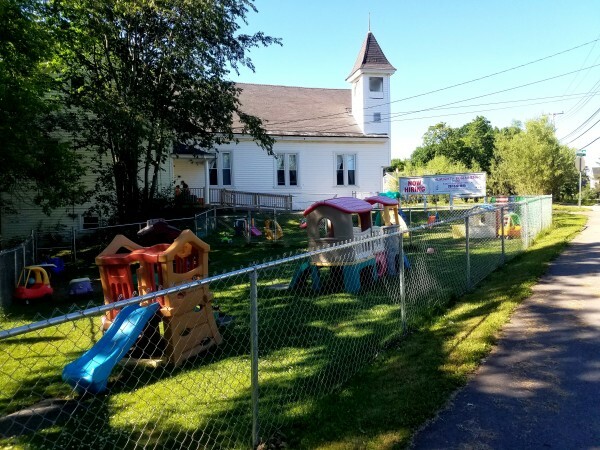 BANGOR, Maine — A 3-year-old boy who made his way out of a child care center near the intersection of Stillwater and Forest avenues on Monday was returned to the facility after he was found by a passerby. The incident happened around 11:40 a.m., when the child went through a fire door of Almighty Beginnings Daycare and Preschool, which was unlocked from the inside in accordance with state regulations, the center’s owner said. Bangor police officials said Monday that the woman who located the child brought him back to the day care and then reported the incident to police. The Department of Health and Human Services, which oversees day cares and similar operations, also has been notified, according to the boy’s parents. The boy was not injured and afterward took a nap, his father, James Higgins of Bangor, said Monday. The boy’s mother, Krystal Higgins of Brewer, contacted the media Monday saying that she wanted people to know about what happened in the hope of preventing another child from escaping. “A child escaped out a fire door at our center today. We are horrified that this happened and thank God that he did not get hit by a car as our center is right on Stillwater Avenue,” she said. It was not immediately clear late Monday afternoon what the rules are with regard to safety doors at child care facilities and preschools. Life code safety experts with the state fire marshal’s office and the Bangor Fire Department were not available at that time. “We take the safety and security of the children in our care very seriously and we will make sure that we double our efforts to ensure the children are always safe and well cared for,” Duprey said. It was not clear Monday whether the boy will continue to attend Almighty Beginnings. His mother, Krystal Higgins, said that her son used to go to Little Angels but was experiencing behavioral problems, such as hitting other children, so she and her ex-husband, with whom he resides, decided to place him in the smaller Almighty Beginnings setting. She said that they were warned he might no longer be welcome if the behavioral problems persisted. Duprey said she could not comment on the boy’s situation. “Unfortunately DHHS confidentially rules forbid me from discussing a child’s enrollment status or any disciplinary problems a child may have,” she said.